Okay, I admit it… I have been busy. Maybe busier than I have ever been. So things get forgotten, like blog posts to update folks on what has been happening. While I usually blog each event, I am going to tell you about a few together. Since September I have been taking a class called Getting your recipe to market. It is a class designed to help a culinary entrepreneur get their product in front of retail buyers, and help folks get their business started from costing our product, to packaging, to licensing to presenting to buyers. This class was recommended to me by another business that now has their products across the country. So I have been working on that, all the while, doing some bazaars for the holidays to end my year on a great note. So on the 12th we will be doing a sales presentation to New Seasons Market. A Portland area retail chain of markets that feature local items, and specialize in fresh, local, and really try to hit the all natural, gluten free, and dietary conscious folks. this class has also put me in front of Market of Choice, who has samples and is looking to add us after the first of the year. they have 12 stores as well, so I am excited to see what happens there. This past 2 months we have done 3 Holiday bazaars, starting with one we were on our 3rd year doing. In Boring Oregon, at the Good Shepherd Church we did the Harvest Moon Bazaar, where we did had our best event with them yet. So many folks came back so see us, and we had a great time. 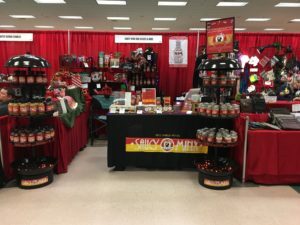 Then we headed to Redmond Oregon for the holiday Food & Gift Show for a weekend at the end of November. We had a booth there and met so many more folks. 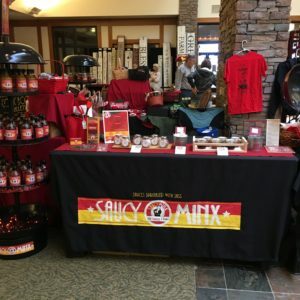 It was interesting that one day we sold more of our fabulous dry rubs than we did sauces. Which tells me we are doing something right with them. Both Mr. Saucy Minx and I had a great time, and really look forward to doing more events on the other side of the Mountains. 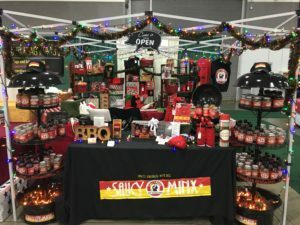 And then the last weekend of November and the first weekend in December we participated in Americas Largest Christmas Bazaar at the Portland Expo Center. This event was HUGE! Two buildings filled willed with vendors many handmade items, bring so many people from all over. I spent half a day setting up and decorating our booth for it, and It was our best yet. We met so many people from the Portland metro area, and it was thrilling to share our products with them. We even had a few friends and family stop by to see us. Our next event is on December 14, at the Food Innovation Center in Downtown Portland. This is open to the public from 4:30-8 pm. At this event you can try products from other start-up businesses. We have people making Lamb Jerky, coconut jerky, date cookies, teas, cupcakes, jerk sauce, salsa, ghee, and so much more. Each of these products are very amazing and everyone has put their heart and souls into them. So if you have the chance come on out and taste what is to come from Northwest Entrepreneurs. Food Innovation Center 1207 NW Naito Pkwy, Portland, OR 97209. Again, Thank you for supporting our business and we look forward to seeing you out in the world.